Alumni, students, and community members gathered at the Robert H. Lee Alumni Centre on Wednesday, March 13 to celebrate the achievements of the 2019 UBC Faculty of Pharmaceutical Sciences Alumni Agent of Change Sarvajna Dwivedi, MSc'88, PhD'92, and Future Alumni Agent of Change Tamara Mihic, BSc(Pharm)'13, PharmD'16. The event was hosted by Dean Michael Coughtrie and included presentations by Drs. Dwivedi and Mihic, followed by a cocktail reception. Dr. Sarvajna Dwivedi has had a twenty-five-year long career in drug development, including several roles in the pharmaceutical industry contributing to the advancement of over 50 molecules in various pharmacological classes. Prior to joining industry, Dwivedi conducted award-winning research at UBC Pharm Sci. He continues to promote UBC research through the Mitchell-Dwivedi Graduate Award in Pharmaceutical Sciences, which he established in 2015. "I consider myself a perpetual student of the Faculty, and of the pharmaceutical sciences discipline. Everything I do is with that spirit," Dwivedi says. "Receiving this award made me feel that I am on the right path." 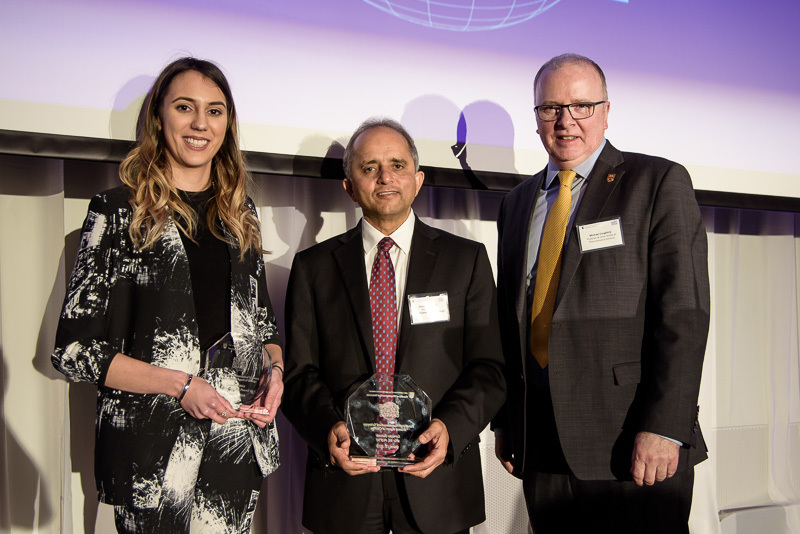 Recipient of the 2019 Future Alumni Agent of Change award Dr. Tamara Mihic is a clinical pharmacy specialist at St. Paul's Hospital in Vancouver, BC and a clinical instructor at UBC Pharm Sci. Mihic works to provide care to patients with mental health and substance use disorders. She has been involved in projects related to opioid stewardship, naloxone education, early psychosis, clozapine prescribing and monitoring, educational resources for patients, and pharmacist involvement in community mental health teams. "I was both very surprised and grateful to hear that I was named the 2019 Future Alumni Agent of Change. I am particularly honoured to be included in a group of pharmacists who have pushed our profession forward in a variety of different areas," Mihic says. "It is also a privilege to have this opportunity to bring more awareness to mental health and substance use disorders, and engage other pharmacists in providing care to these patients." (L-R) Drs. Tamara Mihic, Sarvajna Dwivedi, Michael Coughtrie. Image: Justin Ohata, UBC Pharm Sci. For both Dwivedi and Mihic, patient care is at the heart of what makes their careers in the pharmaceutical sciences so rewarding. "In the mid-1990's, when a seven-year-old asthma patient wrote to us at (GlaxoSmithKline) to say that she could sleep through night, after we launched the first long-acting beta agonist, it was the ultimate testimonial," Dwivedi says. "More recently, when a grandfather suffering from chronic obstructive pulmonary disease (COPD) told the Pearl Therapeutics team that he could play with his grandchildren again, (I felt) the same satisfaction. Such patient stories have been the most rewarding part of my twenty-five-year career." Mihic notes that "it is very rewarding being able to advocate for individuals who are either not able to advocate for themselves or whose concerns and needs aren't heard." "To have a patient put their trust in you at a time when they are most vulnerable is an incredible privilege, and helping to ensure that they have a medication regimen that is effective, safe, and right for them is very rewarding." The UBC Faculty of Pharmaceutical Sciences Alumni Agent of Change award was established to recognize alumni for their outstanding contributions to a clinical, community, education, or research field that has local, national or global impact. Nominations are adjudicated by a selection committee. Learn more.